In most cases, you’ll want to test your soil for any deficiencies that may impede the growth of your new lawn. You may also want to assess the consistency of your soil to determine whether it will require adjustments to improve drainage. Not all grasses are created equal. Choose a variety of grass based on your location, level of intended usage and amount of sun exposure your lawn will receive. The variety you choose may also affect what time of year you are able to install your turf, so be sure you have a complete understanding of your chosen grass. The area of a simple, square-shaped lawn can be calculated by multiplying its length by its width. Lawns with different shapes – like triangular or circle-shaped lawns – may require a different formula. Drawing a simple site plan, especially if your terrain is oddly shaped, can help you calculate how much turf will be required. 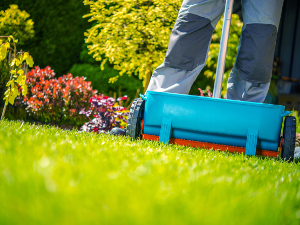 In situations where you’re replacing an existing lawn, it’s important to kill the existing grass and any perennial weeds present in the soil – you don’t want your new lawn being forced to compete for nutrients and water. To accomplish this goal, apply a weed killer. A non-selective herbicide, such as glyphosate, is the idea choice as it won’t affect the growth of your new grass. Weeds may continue to appear after you apply the weed killer – that’s OK! Treat the area a second time and wait 7-10 days before installing your turf. 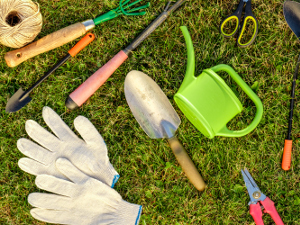 Till the area you’ve selected for your lawn, making sure to remove any rocks, roots, compacted soil or other debris you unearth in the process. Till to a depth of 4-6 inches to ensure your turf has room to develop a healthy root system. 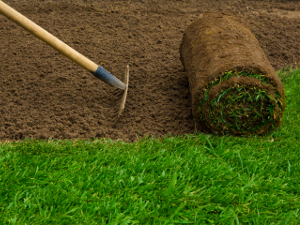 Grading your terrain helps ensure proper drainage, allowing your new lawn to thrive. Where possible, aim to create level terrain by eliminating small lumps and depressions. If slopes are necessary, they should be gradual to avoid issues with erosion. Rich topsoil is essential to support a lush, vibrant lawn. Issues with your topsoil may not present themselves until years after installation, so it’s critical you address any soil deficiencies before you lay your turf. If you’ve had your soil tested, add the necessary amendments to adjust the acidity level and nutrients present in the soil. You may also need to add peat or other organic matter to improve the consistency of your soil. Always make sure that soil amendments are evenly worked into the soil to a depth of 4-6 inches, creating a uniform layer of healthy topsoil. Rototilling the amendments into the soil can help you achieve this uniform distribution. After adjusting the composition of your soil, rake it until it appears even. Your aim should be to create a soft top layer of soil – approximately 3 inches deep – for your turf to grow its roots into. Ideally, you should let your soil settle for 7-10 days before laying turf. This resting period will reveal any depressions or lumps that need grading and give the weed killer time to break down. When placing your order, add 5% to account for wastage. If you have an irregularly shaped lawn, you may need to order up to 10% more. Your soil should be watered a day before your install your turf. If it dries out, water it again. As always, the aim is to have moist, not soggy, soil. Tip: In hot weather, it’s important to lay turf on damp soil in order to avoid damaging the tender roots of your new grass. Begin installing your new turf as soon as possible after it’s delivered. Turf must be installed within 24 hours of delivery – less if it’s hot outside. Always ensure your turf rolls don’t dry out before you lay them. Tip: If it’s sunny and hot, keep your turf rolls covered or in a shaded area. Remember, they should be kept moist, not soggy! Installation is easiest when you start from a straight line: This might be the edge of garden bed, sidewalk, path or driveway. If you don’t have a straight edge, create one by using planks or a string drawn across the lawn. Then, use this straight line to begin laying your turf. Turf should be staggered in a brick pattern. This pattern prevents slipping and creates less noticeable seams. When possible, avoid using small pieces along the outside edge of your lawn: These small pieces are more susceptible to drying out. Instead, start with the full pieces on the outside, saving the smaller pieces for the centre. Shape turf to fit edges using a sharp trowel, square spade or knife. 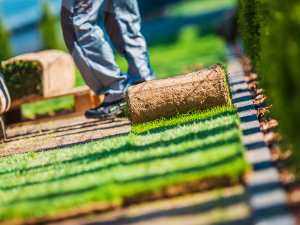 After you’ve laid the turf – or at least a large segment of it – roll it. The rolling ensures good contact between the turf and the soil underneath and eliminates any pockets of air. If you don’t have a turf roller, use planks of wood to apply even pressure to the new grass. Depending on the weather and the size of your lawn, you may need to begin watering the turf before installation even finishes. If you’ve installed an area of 15 by 15 feet, stop and begin watering. All of your new turf should be watered within 30 minutes of installation. After all the turf has been installed, water the lawn enough that the ground underneath is saturated – you can check by peeling back the turf. Tip: Turf edges are susceptible to drying out during and after installation. Curling or yellowing edges is a sign you’re not watering enough! With installation complete, your new lawn is ready to establish itself. Be gentle and you’ll be rewarded with a healthy display of green. It’s important to keep traffic on the lawn to a minimum. The lawn should not be used for at least 2 weeks, with a month being the ideal. Your lawn needs this time to grow deep, strong roots. Watering your new lawn is a matter of balance: Keep the turf and soil moist without leaving it drenched. There’s no one-size-fits-all watering schedule: Different varieties of grass require different levels of watering depending on weather and sun exposure. You may need to water one to three times a day in the first week as your turf establishes its roots. In the second week, you should be able to transition to every-other-day watering. Finally, once your turf has “knitted” itself to the ground, it’s time to establish a regular watering schedule for your lawn. Your new lawn should not be mowed until it has formed strong roots and “knitted” to the soil underneath. However, if the grass has grown so long that the blades fall over under their own weight, you’ve probably waited too long for the first cut. Tip: Never remove more than one third of the grass’ height in one mowing. To maintain your established lawn, develop a lawn care routine that takes into consideration level of use, sun exposure and the nature of the underlying soil. Treat your lawn right, and you’ll be able to enjoy it for years to come!